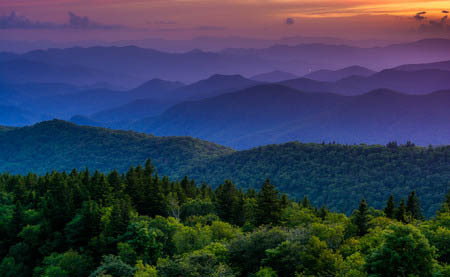 If you are considering buying land in Western North Carolina, the Blue Ridge Mountains are by far the most beautiful and tranquil part of the state to consider. A home in the mountains gives you the chance to slow down the pace of life and enjoy the grandeur of nature. If you are going to make this move, you need to consider a home with a view. Here are some reasons why a home with a view is well worth the investment. One of the beauties of the Blue Ridge Mountains is the fact that the area is beautiful year-round. From the colors of wildflowers in the spring to the brilliant reds and golds of fall, your view will constantly change, but never disappoint. The view will even change day-to-day, as the light moves across the mountain peaks and highlights different parts of the mountains. Living with a view of the Blue Ridge Mountains will give you a close connection to the natural world around you. You may find yourself noticing small things, like the migratory patterns of the wildlife in your area or the diverse species of birds that inhabit your trees, that you never were able to notice before. You will become enamored with the nature that is right outside your door. Homes with a mountain view lend themselves to natural areas that are quiet and peaceful. You will have a place that offers a true escape from the stresses of modern life, a cozy resort-inspired place that is all your own. If you are craving peace and quiet, a mountain view home in North Carolina will deliver it beautifully. For those who are looking for unencumbered views of the Blue Ridge Mountains, Grandview Peaks delivers. With 40-50 mile views that are not blocked by modern developments, our community properties boast the best views of one of the world’s most famous and aesthetically pleasing mountain ranges. Find your mountain property in our western North Carolina communities, and embrace nature at its finest.